What are the common issues with Linksys Smart Wi-Fi Routers and Linksys Wi-Fi Routers? The quickest and easiest workaround for most issues concerning Linksys routers is to powercycle the device. To do this, power OFF the router, unplug the power cord and wait for 10 seconds before plugging it back in. For information on how to resolve these issues, click here. A slower-than-normal download may be due to the IPv6 feature on your computer. One of the solutions may be disabling IPv6. 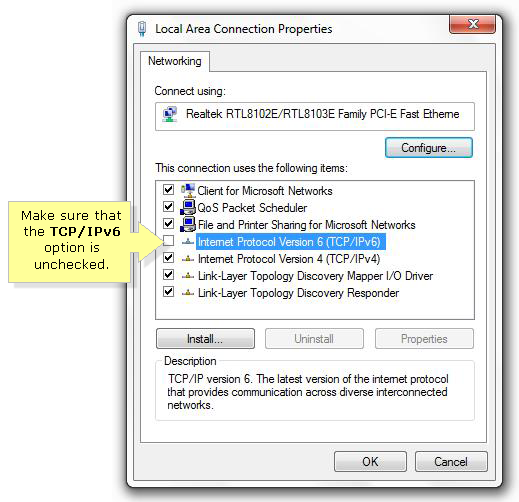 Refer to the technical support of your computer’s operating system for instructions on how to disable IPv6 on your computer. Why this works: The slow download is caused by the use of IPv4 as the default protocol in your network; the slower data transfer is rooted on the “translation” of the data into an IPv6 compatible form. Isolate the issue by checking if your other computers have the same download speed. Check if your computer has the same download speed when connected straight to the modem. i. Perform a firmware upgrade. For instructions, click here if you are using a Linksys Wi-Fi Router. For Linksys Smart Wi-Fi Routers, click here. ii. Reset the router by pressing and holding the Reset button for 10 seconds using a pen or any pointed object. Linksys Smart Wi-Fi Routers and Linksys Wi-Fi Routers are known for their fast upload and download speeds, so if you experience a slowdown in your upload speed, you may need to set your router's Quality of Service (QoS). This means controlling the priority of your network traffic, ensuring that the data you consider most important gets through faster. To learn how to set up QoS, check here. In order to connect to the wireless network, you need to know its wireless settings. These settings refer to the wireless network name (SSID) and wireless password / passphrase. To check the wireless settings of your router, click here. It is also recommended to take note of your wireless settings in a piece of paper to serve as your quick reference in case you forget it. The Linksys router’s web-based setup page can be accessed using a wired or wireless computer. To do this, enter the router’s default IP Address “192.168.1.1” in your web browser’s address bar. A user login will then appear asking you to enter a username and password. If you have not changed your wireless settings yet, you may leave the username blank and the password is admin. For specific details on what to do if you are unable to access the router’s web-based setup page, click here.